Cyril Rutherford "Snuffy" Browne was a West Indian Test cricketer who was a member of the first West Indies Test cricket team, playing against England in 1928. 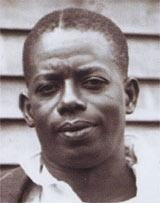 Browne played first-class cricket for both Barbados and British Guiana in a career that spanned from 1908 to 1938. A hard-hitting batsman and a bowler of medium pace, Snuffy Browne hit 103, including two 6's and seventeen 4's, in an hour from the Kent bowling at Canterbury in 1928, when his best bowling figures were eight Derbyshire wickets for 81 runs at Derby. In 1928-29 he did much to enable British Guiana to win the Inter-Colonial Cup. Against Barbados he hit 55 and 95 and took seven wickets, and in the match with Trinidad he made 83 and 24 not out and dismissed 11 batsmen.